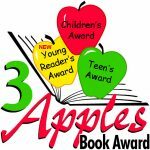 After a 2 year hiatus, the New York State 3 Apples Book Award is back! Started in 2007 by the school library and youth services sections of the New York Library Association, the award celebrates the joys of reading for pleasure. Children and teens, aged 4 to 18, nominate the titles and vote for the winners.Â To vote, kids must read or listen to at least 3 of the nominated books. Voting takes place in April, so it’s time to read! More information on how to get involved is available on the 3 Apples webpage. Kudos to the Section of School Librarians and the Youth Services Section for getting this going again. Many other states & countries have children’s choice book awards and it’s fun to check out what’s popular elsewhere.